Zen DVD Review. I do think that Zen would be better served as a series as opposed to the ponderous nature of the telemovies showcased in this collection. 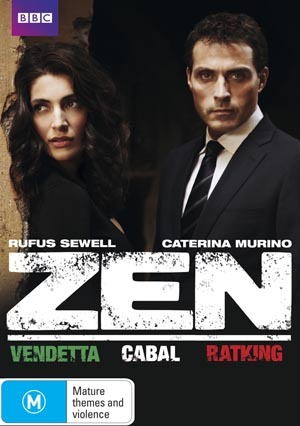 Zen is a two disc series containing three telemovies about Italian police detective Aurelio Zen Starring Rufus Sewell, the series is based on a series of books by author Michael Dibdin, and is shot entirely in Rome with the major characters being English or English speaking. I found Zen to be too distracting, the fact it was shot in Italy, in Rome is both a positive and I think in this case a negative as well. The main characters are all speaking English which is well and good, but the background conversations are all in Italian, and at times I found it disconcerting listening to two languages at once as the audio mix would bring the non important conversations to the fore. I think the initial introduction to Aurelio himself is a bit jarring also. Having stated that, I am a fan of Rufus Sewell so I was prepared to be a bit forgiving but there are so many elements to Zen himself that I think we don’t really get to know him until you sort of don’t care too much. Zen is a detective working in corrupt Rome. A separated man living with his mother and trying to woo a colleague who is still in wedlock, he certainly is no angel and at no time does the series try to paint him as such. He faces a lot of the same problems that the rest of us do and still seems to get the job done. Another facet to the series that I would like to have seen explored a bit more was that I would have liked to have seen the corruption angles hammered at a bit more. Zen himself is not pure or above self benefit, however the multi facets of corruption within his own department are nothing short of scandalous and I do think more could have been done with it. I liked the fact that this series did try to mix a healthy amount of personal and crime story into it. I think this needed to be done for any ongoing endeavour to be successful in the long run, however it did get a bit tedious on occasion. Whether this was due to the editing or scripting I don’t know, but there was more than one occasion where I wanted to skip stuff and get back to Zen asking the hard questions and just being a detective. The cases presented in this series are well worth the watch for fans of mystery, crime and suspense. There are twists and turns populating the story arcs that will keep you guessing all the way through, and the natural backdrop of Rome is breathtaking to say the least, along with the Italian countryside featured when Zen’s work takes him there. I would say that this series is certainly worth watching and I would be keen to see just what they do with it moving forward. I do think that Zen would be better served as a series as opposed to the ponderous nature of the telemovies showcased in this collection.